This theodolite can used to measure both horizontal bearings and vertical elevations, and is therefore sometimes referred to as an altazimuth theodolite. Although related instruments had been published earlier in the century on the Continent, this resembles the English pattern devised by Leonard Digges and published by his son Thomas in Pantometria (1571). 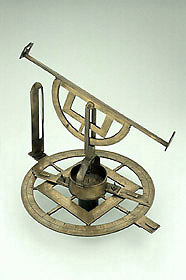 It is the earliest complete theodolite known, though another incomplete example by Humfrey Cole is dated 1574. The device was designed to be easily disassembled so that the horizontal circle could be used independently (while the vertical semicircle could have been attached to a plane table alidade). During the instrument's history, its parts were separated and dispersed; they were only identified and reunited in this century.